Samford University’s May 2017 graduates are working to make a difference in the world. Six months after graduation, a total of 97 percent of those with undergraduate degrees are either employed or continuing their education in internships or graduate programs. Samford’s Career Development Center surveyed the university’s 649 May graduates of undergraduate programs and received First Destination data from 95 percent of them. Of the graduates responding, 51 percent are employed, 42 percent are continuing their education and four percent are engaged in post-graduation internships. The other three percent are seeking employment. 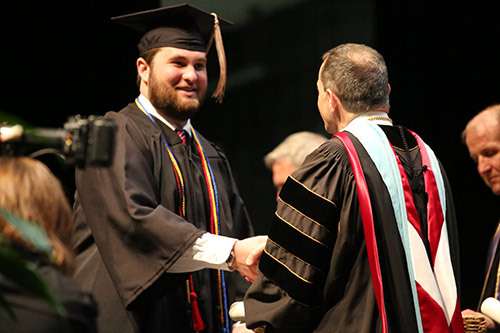 "This most recent data demonstrate what we know to be true: the education and experiences provided by and through Samford prepare our graduates to quickly and successfully enter the workforce, thereby allowing our alumni to positively impact the multiple communities and organizations where they now serve," said Dora Ditchfield, director of the Career Development Center. Ditchfield noted that the center began collecting the data in 2011 and has continually had very high placement rates for Samford graduates.